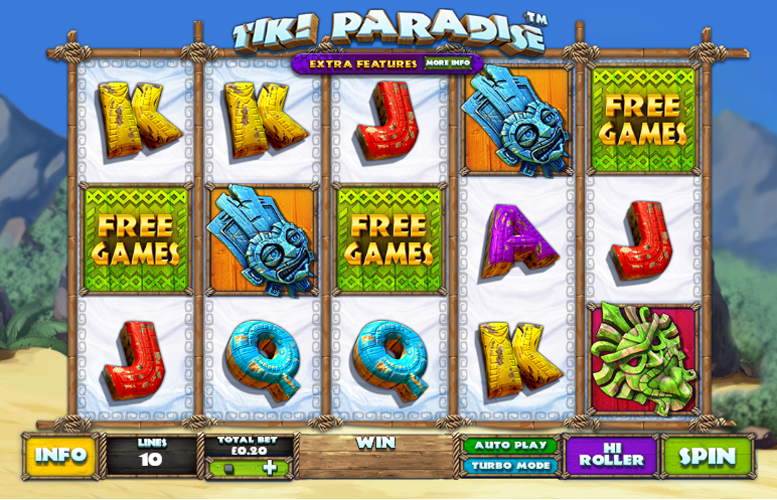 The Tiki Paradise slot machine by Playtech is a solid title that uses great artwork and sound effects to create a suitably atmospheric game. The designers have tried to come up with interesting gameplay features for this one. However, in striving for innovation, they might have created undue confusion for newer players. What’s more, we really don’t like exclusionary bonus features on slot machines. Some of them on Tiki Paradise require players be a member at a certain casino and play instore to access. Great look. The artwork for Tiki Paradise gives the title a strong feel. It’s like actually visiting a Polynesian island right from your living room. Interesting game features. 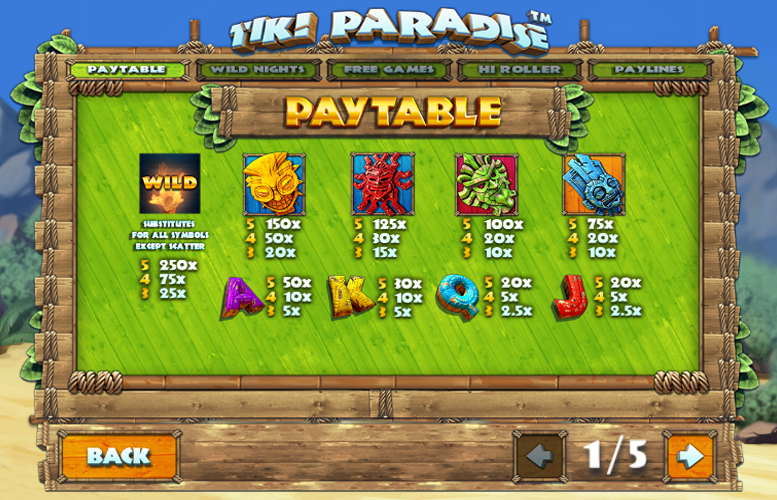 Playtech have clearly tried to think outside the box when designing the bonuses on Tiki Paradise. Whether they were successful in delivering the innovation they’ve strived for is up to the player. Large upper betting limit. High rollers aren’t excluded from enjoying this title. The features are kind of confusing. This might put those inexperienced with slot machines off. One feature requires being a member of a specific casino and playing instore. It’s unclear how this effects the advertised RTP rating, however. “Wild” Fire = 250x the line bet. Orange Mask = 150x the line bet. Red Mask = 125x the line bet. Green Mask = 100x the line bet. Blue Mask = 75x the line bet. 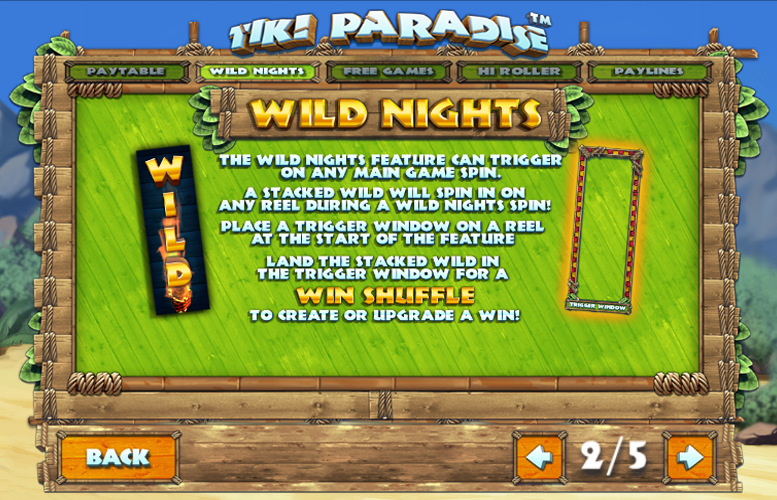 The Wild Nights feature can be triggered on any main game spin. A stacked “wild” will spin in on any reel during a Wild Nights spin. Players must place a trigger window on a reel at the start of the feature. Landing the stacked “wild” in the trigger window will trigger a win shuffle to create or upgrade a win. Landing three of the “Free Games” scatter symbols on reels one, three, and five simultaneously will trigger 10 free games with two special features. Players must pick these features at the start of the free games. The effects of these features will then combine. The special feature are as follows: random win multiplier, stacked “wild” on every spin, and consecutive symbols win. Players can unlock two extra free game features with Coral Connect In-Shop Play. These are 20 extra free games, and masks and “wilds” only. These games are exclusive for Coral Connect customers. During the hi roller mode, players buy five spins with at least one guaranteed stacked “wild”. They must then choose their trigger window for all five spins. If they land a stacked “wild” in the trigger window, they’ll receive a win shuffle. During the hi roller mode, win shuffles can trigger free games. However, each hi roller feature costs 10x the standard bet. Ace = 50x the line bet. 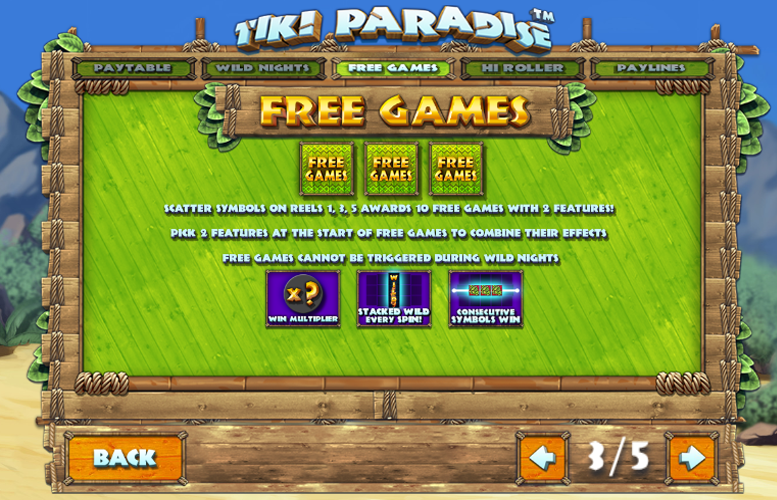 The Tiki Paradise slot machine is played across 10 lines. This number is fixed. Players are therefore only able to adjust the total bet per line. The minimum here is 2p and the maximum is £100. This makes the lowest possible bet per spin just 20p. Meanwhile, the highest is a sizeable £1,000. 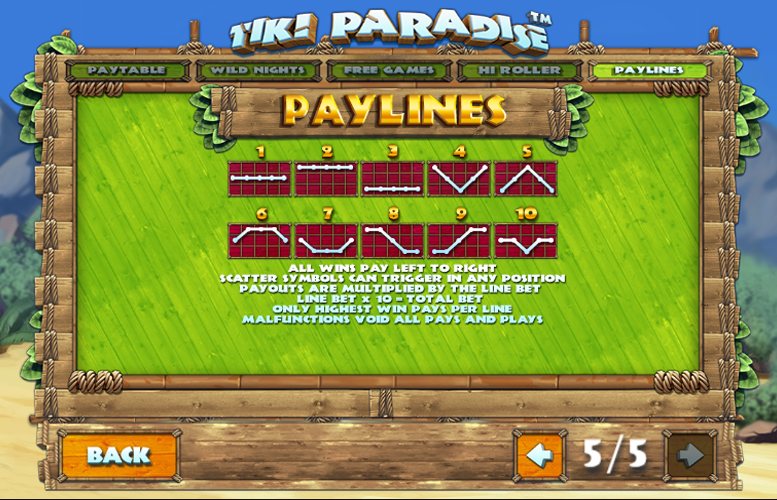 Evidently, Playtech wanted to make sure Tiki Paradise was inclusive of higher rollers when they designed it. Tiki Paradise is a solid effort at making a next generation slot machine from one of the industry’s finest game designers. It uses great artwork and sound effects to create a game that has a lot of character and a strong feel. However, the somewhat convoluted game features limit the enjoyment factor. That and the fact that players must be members at a certain casino to access all the features on the title have impacted negatively on its overall rating from us.